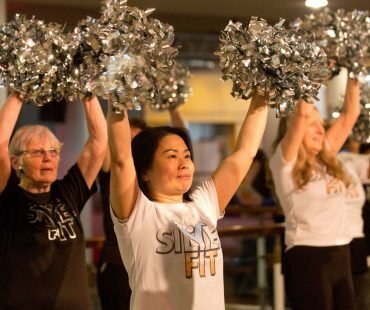 Our Cheerleading activities are not only great fun but also a great way of keeping fit, for both ladies and men. We currently have about 5 routines, and the beauty of cheerleading is it not only exercises and tones the body, it also improves balance, stretches our minds, and improves our coordination and sense of rhythm. 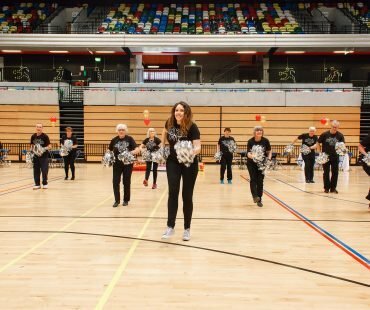 Our instructors are all highly trained professionals from the London Cheerleaders. While our routines are of course quite different than those of professional young cheerleaders we have been asked to perform at various events (see list below). 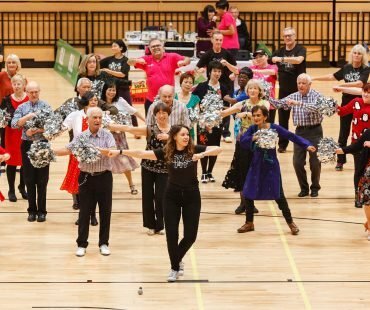 Audiences love our cheerleading demonstrations and when they see what fun we are having, and how easy it is they usually join in towards the end. It helps of course that our routines are performed to some great tracks such as “Heard it Through the Grapevine” by Marvin Gaye, “You Can’t Hurry Love” by The Supremes“, Uptown Girl” by Billy Joel, “Happy,” by Pharrell Williams, and “Brown Eyed Girl” by Van Morrison. 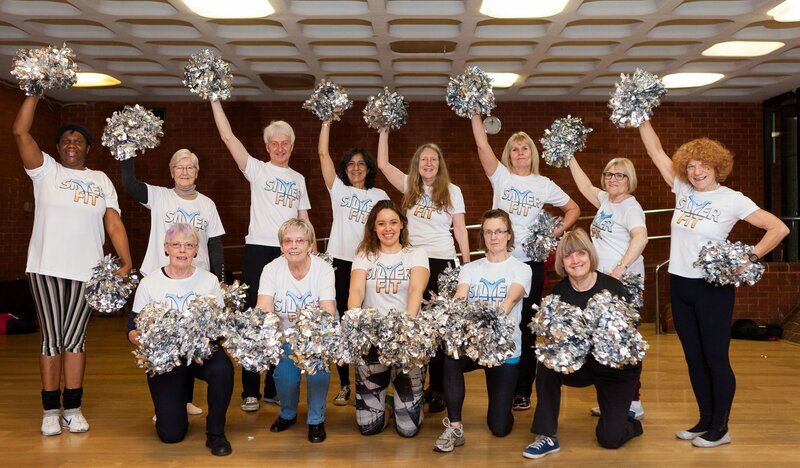 If you would like to join us for some cheerleading come and join us at our Silver Sessions at Docklands, Haringey, The Castle, and/or Brixton. 13 December 2016: Tea Dance Copper Box. London Legacy Development Corporation. A fantastic event with nearly 400 people. Appearing in an Olympic venue was great fun and a good end to our year. 11 November 2016: GLL Games Copper Box. 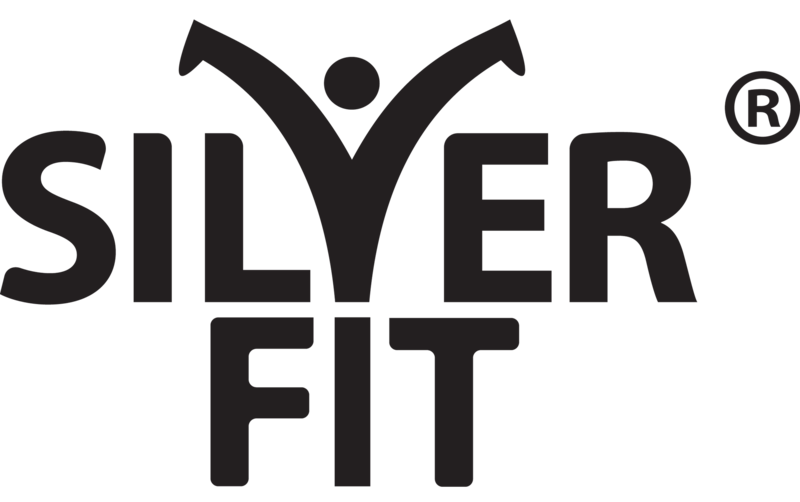 Silverfit was very well represented at this event, especially from Crystal Palace and the Cheerleaders. Most of us participated in one way or another from short bowls, table tennis, swimming and cycling. For us Silverfitters competing in an Olympic venue was special and great fun. We arrived to unlimited Coffee and biscuits which kind of set the day up for us. We performed a couple of numbers during the award ceremony, and we also got photographed with Duncan Goodhew MBE Gold and Bronze Olympian. 30 November 2016: Docklands Settlements, Carpenters Hall. Carpenters Hall is a City of London Livery Hall. We were invited to participate by the Docklands Settlements Charity, with whom we work at our Docklands Venue. 02 October 2016: Silver Sunday Burgess Park. This was a great event being the first SilverSunday in Burgess Park, we worked with many different groups and organisations. We introduced our very own Grim Reaper, as a reminder of the importance of keeping fit. 02 October 2016: Fun Palaces, Brockwell Park. We continued this days activities by appearing at the Fun Palaces event in Brockwell Park. A very busy event with lots of families. We invited the audience to join with us and it was smiles all round. After which we had coffee and cake by the pool, very relaxed and chilled. 10 September 2016: Unity Games, Surrey Quays. Despite being very short on numbers we were very well received and built some useful bridges with those involved. 03 September 2016: Haringey Walking Weekend. Our very own Edwina Brocklesby was invited to give the opening speech at this event. We cheerleaders performed a couple of numbers at the very start before Edwina gave an inspiring and motivating talk. 16 July 2016: Lambeth Country Show, Brockwell Park. Lambeth Country Show is visited by thousands of people, and was a great place to showcase what we do. 15 June 2016: This Girl Can Filming/Pop Brixton. We produced a short funny clip of us warming up, its speeded up and fun to watch. 08 June 2016: Popfields Brixton, Launch. More Filming and Dancing and a short break with the film crew for football. 06 June 2016: ITV this morning. Filming with Dr Zoe Williams. Cheerleaders Edwina, Diane and Barbara were asked to test electronic activity monitors like “Fitbits” and give their opinion. 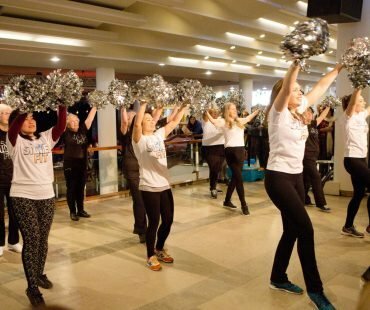 12 March 2016: WOW Festival, Royal Festival Hall. We appeared at the Women of the World festival, we had just one routine at this time since we had only been in existence for eleven weeks. It was great nevertheless and we were well received!